We’ll do our best to make your stay in Kyoto as comfortable and memorable as possible. We wish to offer travellers an opportunity to meet other travellers in a cosy environment, allowing them to exchange cultural experiences and make new friends. We offer a variety of rooms for an affordable price and comfortable stay in Kyoto. All rooms are equipped with air conditioning. All of our twin rooms have bunk beds. *From October 1st 2018, Kyoto city will begin to impose TAX of 200JPY/person/night. This TAX will be added to the price of your room charge upon arrival. Our individual shower rooms are available 24hrs a day. We have a spacious communal tatami lounge with free Wi-Fi; there’s also a fully equipped guest kitchen, a communal TV room , a terrace with picnic facilities and a rooftop terrace with great views over Kyoto. Facilities include English newspapers, a tourism information board, free coffee and tea, bicycle rental (800yen/day) and laundry facilities (300yen/wash and dry). Guests can also borrow the iron, ironing board, foreign adaptors, guide books, alarm clocks, padlocks and iPhone charger for free! Our travellers’ cafe and bar, Zen Cafe, is open from 8am to midnight. It’s located on the ground floor and offers draft beers, cocktails, sake, wine, soft drinks, coffee, tea and more. Our western style full breakfast is available every day from 8:00am to 11:00am and only costs 500yen ! Our friendly English speaking staff will be keen to help you with any tourist information you need. Our hostel is located near Kyoto station and within reach of the Higashiyama area (Kiyomizu-temple, Gion district, etc) and downtown. Within walking distance of here you'll find restaurants, convenience stores and ATMs. K's House hostel chain was voted the Best Large Hostel Chain Worldwide in 2011 by Hostelworld.com customers! 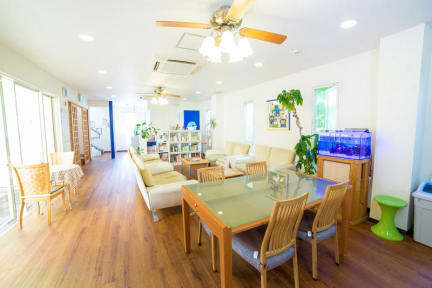 And K’s House Kyoto was voted the best in Japan and Asia at the 2012 Hostelworld.com Hostel Awards! 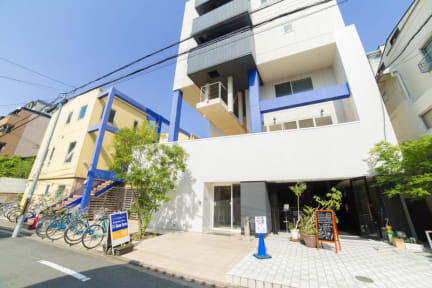 Check out our sister hostels across Japan, also listed here on Hostelworld: our brand-new K’s House Takayama,K’s House Takayama Oasis K's House Ito Onsen, K's House Tokyo Oasis, K's House Tokyo, K's House Hakuba alps, K's House Mt.Fuji ,K’s House Hakone, and K's House Hiroshima. Good location, short walk to Kyoto Station and a helpful bus stop just across the street. Lots of nice lounge areas and the bar/cafe on the main floor has a fantastic happy hour. absolutely loved this hostel! it was huge and better than i expected, 2 places to chill and has a great zen cafe! the staff were extremely kind and i would highly recommend staying here you wont regret it! Decent place, somewhat typical of Japanese hostels in its cleanliness and room size. My only real complaint is the sun beams right into the rooms in early morning, forcing you to get up. Sometimes a little extra sleep is welcome, you know? Good location close to the station but a bit of a walk to get anywhere else. The cafe/bar was very handy and lounge area. Very unusual mix of people for a hostel with familys there too. Bedrooms where basic. My friend was on the top bunk and there was an aircon on wall right in her face so not the best lay out. Clean and well located near the main station. Unfortunately the window in my dorm had no curtain or screen to block the streetlight outside, so the room was quite bright all night. Good, basic hostel for staying in Kyoto. However, the facilities were pretty basic, and the atmosphere was kind of weird. There was a big lounge area, but nobody was really socializing. Staff were nice and helpful. The bunk beds have a compartment underneath where you can store your bags. For security I recommend borrowing a lock for $1000 yen. Contains both a washer and dryer on the 2nd floor (both appear to take 45 mins each). There is also an attached bar with decent food and some nice drinks. We booked a private room. It was bunk beds. The room was small but wasn't bad. However the walls are super thin here! We could hear everything from our neighbors beside us. Though quiet hours start at 10pm there's really no way to enforce that so people were loud after 12am. We also got the short end with our room being next to the shower and we were right under the lounge area. The showers weren't bad but coed. The Lounge area was nice as well. Not enough laundry though.